If your household is anything like mine — with my work schedule, spouse’s schedule, kid’s school and events calendar, social events, household chores, and pets — things can get a little crazy. I rely on my digital calendar to make sure I stay on top of everything. For me, a digital calendar is the way to go since we’re rarely at the same place at the same time. Having the ability to access our schedule, any place and at any time, keeps us on track. Because LifeTopix works with iOS calendars, it’s my main point of entry for the family’s shared calendar. “Calendar” (formerly called iCal) is the calendar application by Apple that runs on Mac OS X. It offers support for multiple calendars, and includes the ability to publish and subscribe to calendars from Web Distributed Authoring and Versioning (WebDAV) servers. In other words, the calendar that’s located on your Mac, iPad, iPhone, or iPod touch supports calendars that are published on the Internet. Users can collaborate on those calendars and your calendar can pick up the schedule, as well as the changes by the authors of the chosen Internet calendar. Because LifeTopix supports iOS calendars, you can view the schedules from published iOS calendars. Subscribing to or downloading published calendars on the Internet, such as holiday calendars, sports calendars, or school schedules allows you to view those scheduled items directly in LifeTopix — which saves you precious time by avoiding manual entries. On your iPad or iPhone, go to http://icalshare.com/ or other sites that allow you to subscribe or download calendars (.ics files). 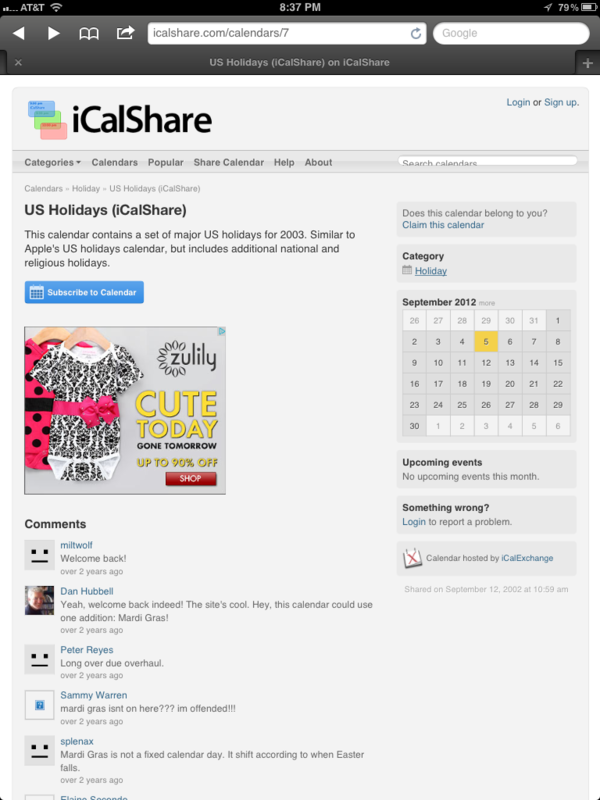 I’ve chosen the following US Holidays calendar from iCalShare. Locate the calendar you wish to use, and then tap Subscribe to Calendar (in blue above) or the button that allows subscribing. “Calendar” adds the calendar and like magic, you’ll see the schedule in LifeTopix. If you need help setting up your Google Calendars to work with your iOS devices, Google provides a concise set of instructions at Set up Google Sync with your iOS device. This description shows how to sync the calendars through the native applications on your device. You can also connect them through CalDAV as explained at CalDAV Calendar Sync. If you’ve set up your Google Calendar(s) to share data with iOS calendars, then you can view that information in your LifeTopix My Calendar through our native integration with iOS calendars. 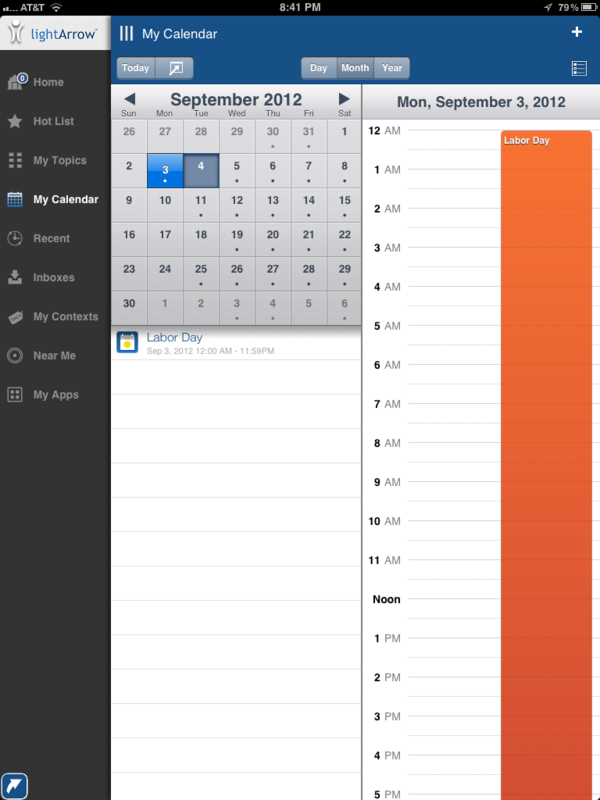 Our native calendar integration even supports multiple calendars. We suggest that the main caretaker’s calendar is the main calendar, and that this calendar is shared with the family members. In a later release, we plan to extend our support for multiple calendars so that when you create a new date-oriented item, you can specify the specific calendar that item should be added to. An important part of the family schedule is meal planning. 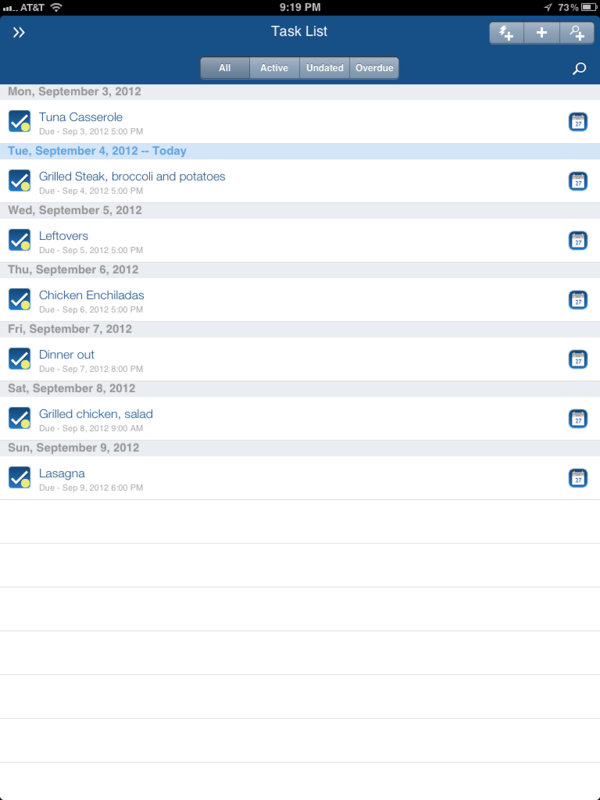 LifeTopix is very flexible, so there’s many ways to set up meal plans. I’ll show you a quick and easy way to plan a week of meals. Create a Project called “Meal Plan” (Tasks + Projects > All Projects > ). Start on the current day and choose an end date that works for you. Create tasks for each day’s meal for the Meal Plan project. Add a task for each day’s meal (Meal Plan Project > Add Item > Task > New Task). Create a shopping list for the Meal Plan (Meal Plan Project > Add Item > Shopping item > Product). You can select and add multiple shopping items all at once. Your meals will appear on your task calendar and (if you wish) on your main calendar (My Calendar). 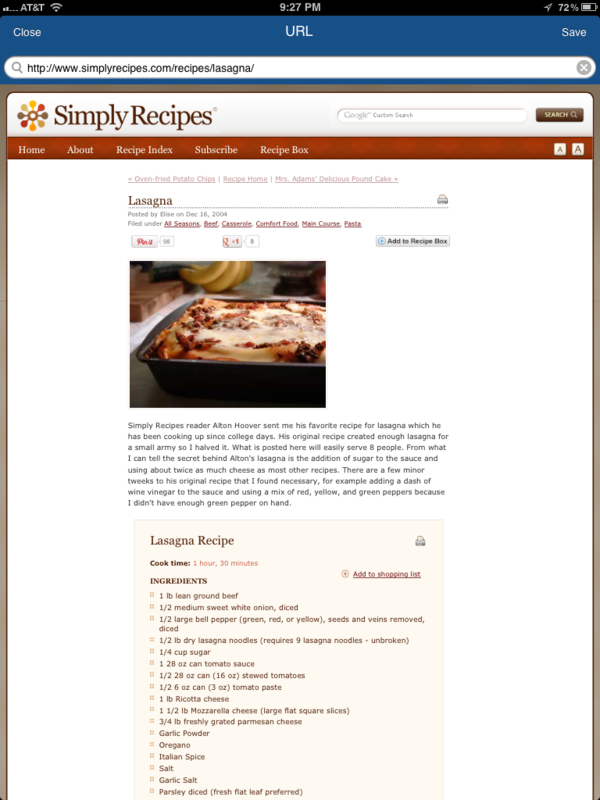 You can also create bookmarks to recipes you’re using (Meal Plan Project > Add Item > Bookmark > Save the URL), which makes it super easy to find your favorite recipes. Face it, we all have them — those chores that we ask our spouse or partner to finish. If you’re not familiar with “Honey-Do Lists” or need advice on how to effectively use them, see what is a honey do list from wisegeek. If you’re accustomed to creating Honey Do lists (and your significant other is a willing participant), I’ll show you a simple method to create the lists, and to share them with your significant other. Create a Project called “Honey Do Lists” (Tasks + Projects > All Projects > ). Start on the current day and choose an end date that works for you. I prefer to keep the end date empty. Create a checklist for the recipient. 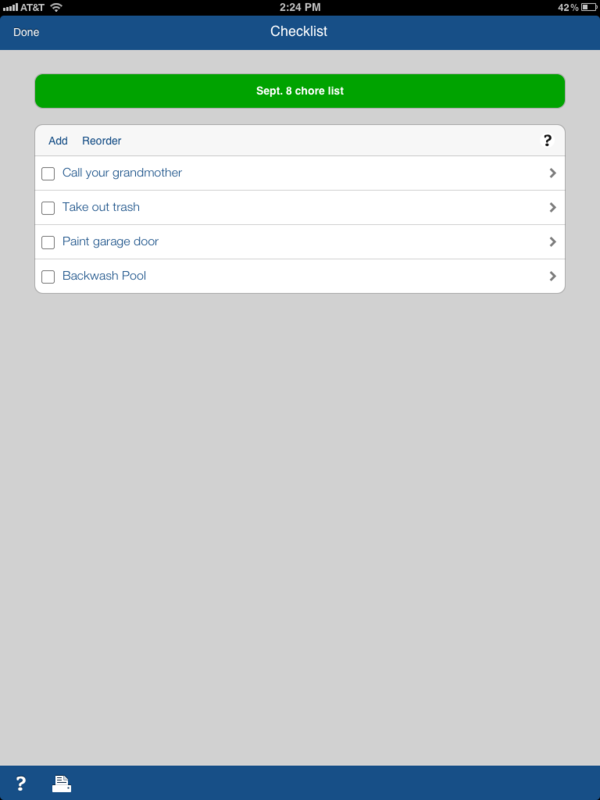 Add an item for each thing to do (Honey Do List Project > Add Item > Checklist > Add). You can easily share the list with your spouse or partner via email or SMS. 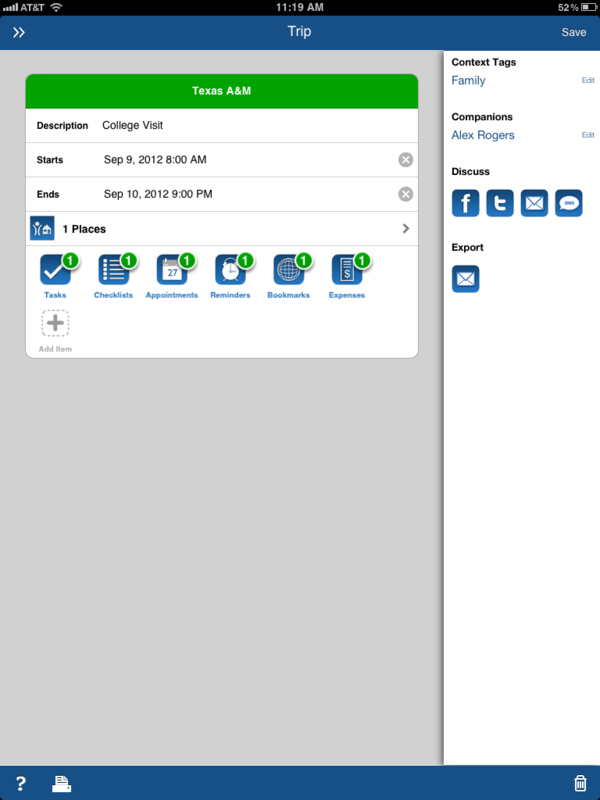 Simply click the appropriate sharing icon in the right panel to share the list. Email is a great method to use. Your significant other can open the list directly from the email and view it in their LifeTopix app. Managing family outings; college trips; and out-of-town sports, band, or cheerleading events can be challenging for a busy family. LifeTopix includes native support for handling trips. Create a Trip and name it appropriately (Travel + Places > Trip Calendar > ) and enter the start and ending dates for the trip. In the following example, it’s a college trip to Texas A&M. After creating the trip, there’s a variety of options that you can provide, such as tasks, checklists, appointments, reminders, bookmarks, files, audio, photos, video, notes, expenses, and shopping items. What’s really handy is adding itineraries as files and bookmarks to websites that you might visit while you’re at the location. You can also take photos and view them later. You can add trip companions, and share this data via social media, text message, or email. Email is a great method to use to share the trip with your family members. They can open the shared trip directly from the email message and view it in LifeTopix. 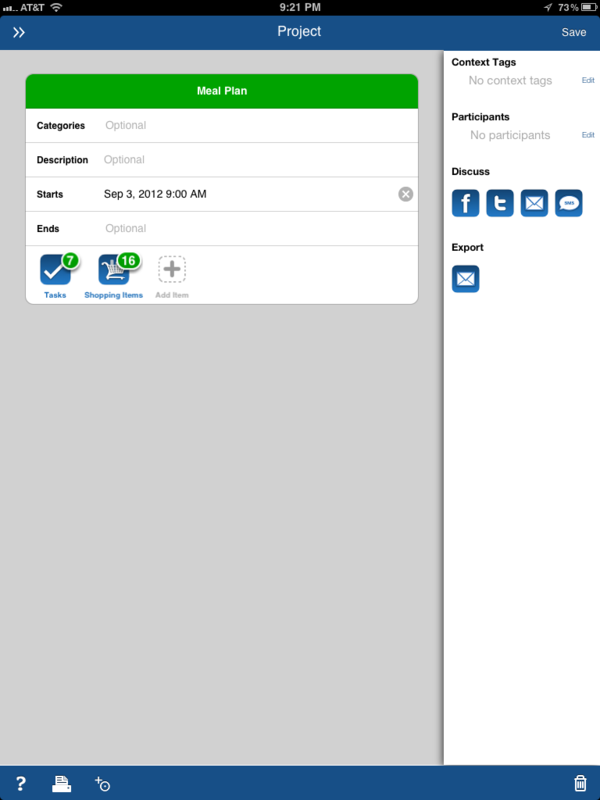 How does your family stay organized with LifeTopix? Please comment and share your tips & tricks. You can find LifeTopix at the App Store.